On the 10th of June this year , Hutchison Port Holdings HPH introduced a new terminal operating system: nGen at their Felixstowe container operation. There followed a series of severe delays and diversions to vessels calling the port. Despite repeated assurances that this was a temporary issue related to “system communication inconsistencies within the container yard” that would be resolved soon, problems continued for the next few months. Latest reports suggest that while the situation has improved, the port’s operations have not returned to the operating levels seen prior to the new system implementation and the facility is still “playing catch up” with thousands of misplaced empty boxes requiring double handling. At ClipperMaritime, we have invested significantly in our data sets, which allows us to analyse maritime transport issues at the most granular level. The analysis presented builds on AIS data derived from satellite vessel tracking that allows us to track actual voyages, arrivals, and call duration at terminal/berth. Our analysis indicates that even though a partial recovery can be observed after the initial collapse in June-July, the port seems to be far from its pre-nGen period in terms of TEU deployed, average call duration, and the number of deep-sea services calling. All data presented in this report is available on an ongoing basis through our interactive dashboard tool: get in touch with one of our team members to explore further. In July 2018 the average call duration increased dramatically from 29 hours in May to 47 hours – a 77% increase in comparison to July 2017, while the TEU vessel capacity deployed at the port decreased to 780,000 TEU from over 1 million in May – a 24% decrease in comparison to July 2017. The decrease observed in the average call duration in September could be attributed to two main factors: the port operator getting a better control of operations with the new system in place, or decreased TEU volume handled at the port allowing for better management of the remaining containers. In an effort to adjust to the delays and diversions, some lines have altered their schedules. Four deep-sea services have been redirected, since July, to competing container terminals, thus restructuring the network calling patterns in the region. This section examines at a more granular level the changes presented in Figure 1, by considering container vessels of different size category. Figures 2 and 3 show that when comparing the five month period that the nGen system has been in place with the five months prior to that, the least affected vessel category is ULCV. The TEU deployed and number of calls by those vessels decreased by a little over 20% (against an over 30% decrease on average) and the average call duration increased by 24% (against a 38% increase on average). This could be an indication that the operator would likely prioritise handling the largest ships in order to maximise the number of containers moves. That hypothesis gains further support by the fact that the TEU deployed and number of calls recorded for Old Panamax and Feeder vessels – the two smallest categories – has decreased faster and their calls duration have seen a much greater increase than the average. Figures 5 and 6 provide further insights by breaking down the fleet by vessel size and vessel operator. The information displayed here broadly corroborates the findings from Figures 2 and 3. The higher percentage of larger vessel classes deployed by an operator, the less affected they are. The vessel operator least affected by the delays is also one of two largest in Felixstowe: MSC. The average call duration during the last 5 months increased by 24% in comparison to the 5 months prior to that, far below the 38% average. 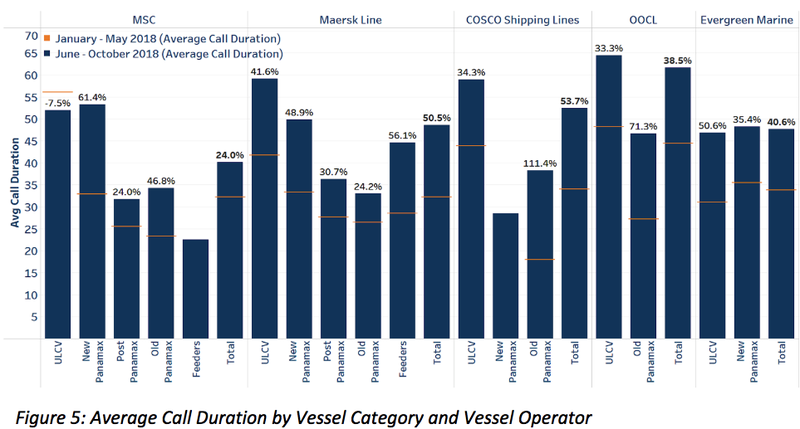 In addition, MSC ULCVs were the only vessels to enjoy a decrease in their call duration, by 7.5%. Despite that, the TEU deployed by MSC decreased overall by 33% - higher than the 31% average, partly due to the significant delays that New Panamax and Old Panamax vessels faced. On the other hand, the most affected operator by delays seems to be COSCO. The company’s ULCV call duration rose by 34%, while the Old Panamax call duration spiked by 111%. This could be identified as the main causal factor to COSCO decreasing its deployed TEU to Felixstowe by 39% - the highest among the top 5 operators. More specifically, Old Panamax deployment collapsed by 77%, while ULCV deployment decreased by 37% - 14 percentage points more than the average of 23%. Following the delays and diversions after the introduction of the nGen system, Felixstowe has faced a decline in its deep sea service calls from 13 in May 2018 to just nine today. Figure 7 shows the services calling at Felixstowe from May to November 2018. The WAF6 service stopped calling at Felixstowe and now calls at Wilhelmshaven directly after Algeciras. Similarly, TA3/ATL3 is no longer calling at Felixstowe and now goes direct from Antwerp to Rotterdam. Services EPIC1/IPAK/IOS2 and Colombia Express were redirected to London Gateway and Liverpool respectively. The AE2/Swan service has stopped operating all together for reasons unrelated to the developments in Felixstowe, but due to the Chinese Golden Week Holiday in October and softer global demand.